The class of rookie receivers last season was one for the ages, and has received plenty of offseason publicity. Fantasy owners, fans and analysts alike all await with baited breath the encore the 2014 NFL Draft’s receiver class has in store. The names of Odell Beckham Jr., Mike Evans and Sammy Watkins are all bandied about with optimistic sophomore season projections. Even some of the lower tier players, such as Jordan Matthews and Martavias Bryant are rightly drawing intrigue. These players are all quite good, and deserving of the attention brought their way. Yet, there is another second year receiver not often mentioned in their class, but is just as qualified to churn through the hype machine. We are not giving nearly enough credence to the idea that Allen Robinson, of the Jacksonville Jaguars, is sitting at the precipice of a massive statistical season. Whether because he plays for a team that fielded a deficient offense, or his ending the season on Injured Reserve, Robinson is not mentioned in the same breath as his second year peers. The top-three of the 2014 receiver class feel untouchable, at this point. Yet, a close look at Robinson’s Reception Perception data reveals that he may not be as far off as some imagine. Allen Robinson was a part time player for Jacksonville in the first two games of his rookie season. It did not take long for the team to recognize they had something in the prospect they traded up for. He was a starter as soon as Week 3, and his snap count jumped to more reflect that of a down-to-down contributor. Despite coming into the league at a very young age, and not being a first round pick, Robinson displayed impressive polish. 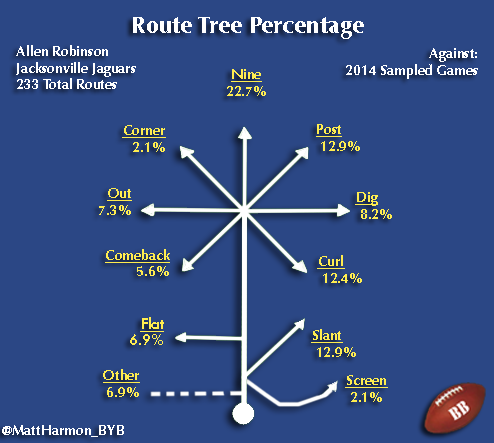 Through an eight-game sample, Allen Robinson came out with one of the more balanced Reception Perception Route Percentages chart. This was especially true when compared to his fellow rookie receivers. While vertical and in-breaking routes are the highest represented patterns, the rates are not exaggerated to the degree they were for Watkins, Evans or even Beckham. Robinson tried his hand at everything when he played last season, and showed an advanced understanding of multiple route concepts. The Jaguars have not had a consistent receiver in many years. Even now, the other players on their roster are limited or specialty players. Robinson brings something new to Jacksonville, with his ability to run the full route tree. After struggling for long stretches as a rookie, quarterback Blake Bortles could use a calming force in the passing game. From Weeks 3 through 10, it looked as if he and Robinson were beginning to settle into a grove. Unfortunately, the receiver’s foot injury forced that budding relationship to be put on hold. When the Jaguars begin preparation for the 2015 season in camps, Bortles will certainly be relieved to see Robinson out wide once again. Not only will he provide the quarterback with a diverse partner, but also one who can be a target on most every level of the field. 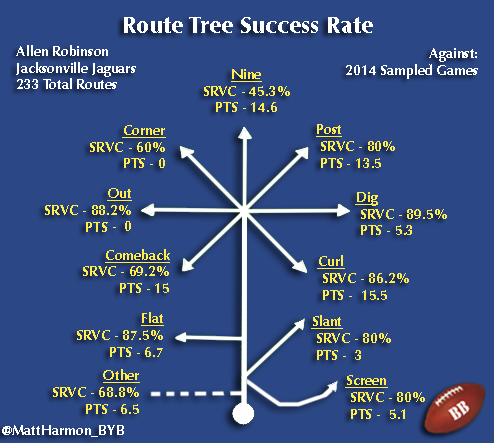 Allen Robinson’s SRVC by route scores were simply fantastic. All of his in-breaking route marks were above the current NFL average, including quite high SRVC on posts and curls. Robinson showed great comfort going over the middle of the field. He does not lack for toughness, and breaks well at stems. The aspect of the chart that best shows his advanced and nuanced understanding of route running is his scores on out and digs routes. Coming in with an SRVC above 88% on both patterns, Robinson was one of the best performers in the NFL, charted for Reception Perception, on outs and digs. Both are some of the routes receivers run the least often, because they require an advanced integration of timing, foot frequency and hard steps. It was surprising to see Robinson perform at such an excellent degree on these patterns as a mere rookie. The Jaguars can feel confident that he has every chance to progress into one of the better route runners in the league. Robinson does need to improve his work in the vertical game. His SRVC on nine-routes was below the NFL average. Interestingly enough, his scores consistently dropped as the season went on. It appeared that the more attention Robinson received in the deep game, the less often he was able to get open there. Even though he’s a big receiver, he is not necessarily slow. But Robinson does not appear to carry the speed needed to threaten competent defensive backs down the field. The proficient route running technique he displayed on short and intermediate patterns did not carry over to his vertical chances. Given his 4.60 40-yard dash time, he may never develop into a burner. So, Robinson must improve in the deception, and double move game in order to become a complete receiver. Another way for Allen Robinson to improve his proficiency in the deep game would be to better use his large frame. One concern surrounding this young receiver coming out of Penn State was his tendency to get bumped off his routes. Standing at 6’3 and over 210 pounds, Robinson should be a physical presence as a pass catcher. To this point, he has not been able to maximize his frame in the college or pro game. Robinson’s SRVC of 69.2% on comebacks hovers just around the current NFL average. While he takes good hard steps at the break points, he could better use his body as a shield on these routes to improve that score. His contested catch conversion rate came in at 64.3% on 14 attempts. While that is not at all poor number for a Reception Perception sample, it is not outstanding and falls near the average. He’s no liability in contested situations, but given his size, it’s a figure you’d like to see improve. Timing, and athletic jumping ability are not questions, which leads one to believe that Robinson just needs to use his frame as a barrier a bit better. Should he accomplish this feat, he’ll improve his SRVC on fly routes, and vertical ability, despite any lack of raw speed. Even though he never had a dominant stat line in 2014, and did not record an eye-popping PTS total on any route, Allen Robinson had an excellent rookie season. Any lack in his statistical output was to no fault of his own. Robinson gave his quarterbacks a reasonable target to throw to on the vast majority of plays. As always role, assignment and opposition paint the context needed when comparing Reception Perception stats for these receivers. However, that should not at all take away from how outstanding Allen Robinson’s scores were. For being a big receiver, Robinson really thrives at earning separation, and in the “small” section of the game. He wins with both quickness and proficient route technique for a rookie. While factoring in growth can be tricky business, the Jaguars have to be encouraged that Robinson has already shown so much on the field, and is still only 21 years old. If he improves by even a few notches, his Reception Perception sample shows he will easily be their number one receiver. If Robinson learns to better incorporate his frame into his skill-set, he’ll begin to integrate aspects of the big receiver game into his already excellent ability to separate from coverage. Such leaps could see Robinson vault himself into the highest ranks of NFL receivers in a few years. At it stands today; Allen Robinson is being overlooked as a sophomore receiver from a historic class standing on the precipice of a massive statistical season. He is by far the best pass catcher the Jaguars have, and should be the presence his quarterback desperately needs to lean on. He’ll receive targets at every level of the field, due to his high SRVC scores on multiple routes. Don’t be surprised if Robinson follows the likes of Odell Beckham Jr. and Mike Evans down the path of early career breakouts. Even though he’d be a year later than those players, his potential explosion could rock the football world in a similar fashion.